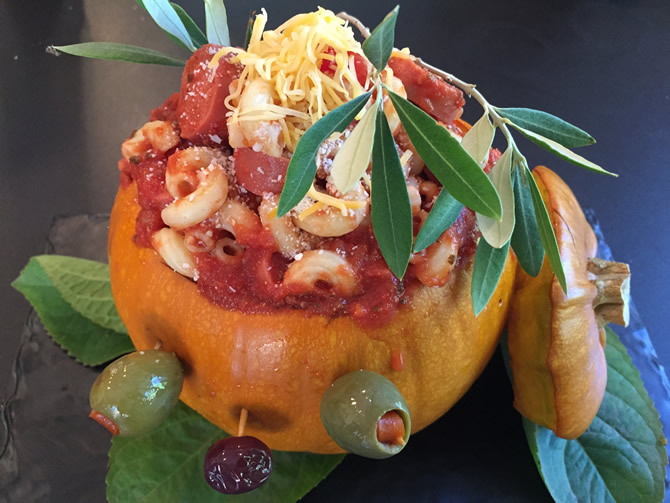 A new Halloween favorite served as bloody brains in a pumpkin head. Cut the top portion off the pumpkins and discard the stringy pulp. Save the seeds to dry and roast. In a shallow baking dish, place the two larger rounds cut side down and cover with foil. Completely cover the tops with foil and place in smaller baking dish. Bake pumpkins in the oven for about 1 hour for a medium-sized sugar pumpkin, or until just tender. Top portion should be taken out after about half an hour (pumpkin bottoms will be cooked another half an hour). Meanwhile, bring a large pot of lightly salted water to a boil. Add pasta and cook for 8 to 10 minutes or until al dente; drain and place in a large bowl, stir in pasta sauce, hot dog slices, and cheese. Spoon mixture in pumpkins. In a medium bowl, combine eggs, cream, milk and stir until smooth. Pour gently over macaroni mixture. Sprinkle with Parmesan cheese Bake in preheated oven about 30 minutes or until set. Decorate pumpkins with googly olives for eyes.